I'm not sure how I feel about the coining of a proper name such as "Ajax", and its use in contexts such as "Ajax engine." It's always helpful to identify and describe patterns in development, but this usage implies a brand identity and productization that just doesn't exist. In its defense, Ajax is way easier to type. Still, it's amazing how much expressiveness has been introduced into web transactions with the introduction of a simple mechanism for in-flight HTTP requests. Writing applications in this style raises a few interesting questions, especially: where does it stop? With two methods for performing HTTP transactions, it's good to know where to use regular page reloads. 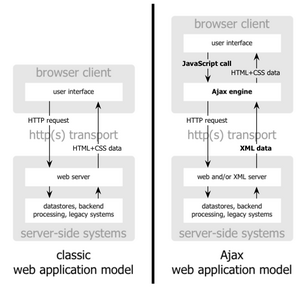 Ajax introduces some confusion into traditional application designs: if you're using a pattern like MVC to design your server-side code, Ajax now gives you two views and two models, where the server's view is the client's model. This is weird. Flickr gets this right, using in-page requests for small, local tasks like updating image titles or descriptions.